La Flor Dominicana's powerful Double Ligero cigars are grown at the La Flor Dominicana farm. 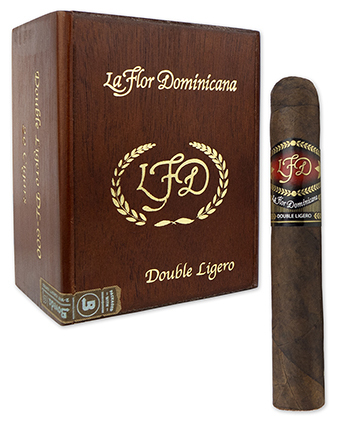 One of the strongest and most well-balanced in the LFD lineup, these full-bodied cigars feature well-aged Dominican long filler tobacco and ligero binder. The Double Ligero Natural is wrapped in a dark Ecuadorian Sumatra sungrown leaf delivering enjoyably bold notes of leather, spice, pepper and cedar. Double Ligero Maduro cigars share the same Dominican long filler tobacco and ligero binder as their Natural counterparts, but are draped in a Connecticut Broadleaf for a lush smoke with leather, sweet cream, and spicy notes. Whichever you choose, we recommend lighting up these cigars after a large meal.